The company’s second appearance at DemoFest will focus on an exceptional example of game-based learning for sales associates. 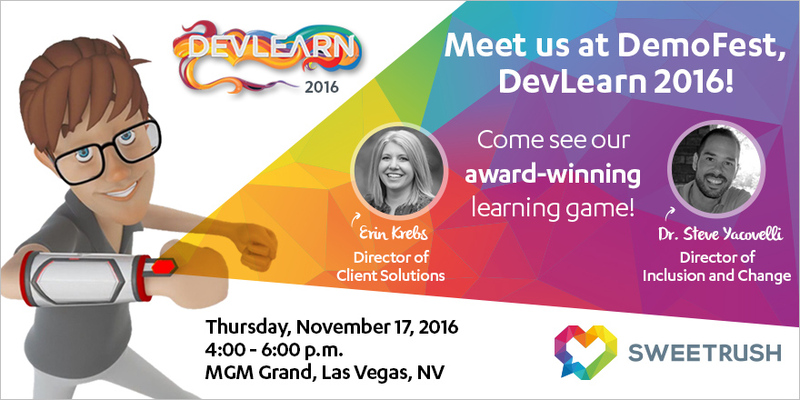 San Francisco, California, November 7, 2016— SweetRush is proud to announce its participation in DemoFest, part of the prestigious DevLearn 2016 conference for learning and development professionals. Two of the best and brightest at SweetRush, Erin Krebs, Director of Client Solutions, and Dr. Steve Yacovelli, Director of Inclusion and Change, will present a Brandon Hall Excellence Award-winning game developed for tire sales associates. DemoFest will take place at MGM Grand. The game will showcase best practices in game-based learning and serious games for a Millennial audience, including challenging scenarios, engaging interactivity, feedback incorporating humor, working against the clock, and “special powers.” It serves as the culmination of an online learning program for extended enterprise sales associates, testing the skills they’ve gained throughout the program in over 100 eLearning courses. In addition to receiving two gold Brandon Hall Excellence Awards, the game has also garnered an International Serious Play Award. Steve and Erin will also present a session on hidden or unconscious bias for instructional designers and facilitators.